In my book, Your Church Is Too Small, I urge what I call “missional ecumenism.” This is a textured theological way of saying that we need to show the world our unity by what we do together, especially in talking and doing the mission of Christ in the world. I mentioned several American evangelists in my previous blog but I could include many others, including men like George Whitefield and John Wesley. Both Whitefield, the Calvinist, and Wesley the Arminian, never excluded Catholics, liberals, or any others from their efforts to preach the gospel to as many people as possible. These men, along with Billy Graham and countless others, brought churches together that had been separated over many lesser matters in order to share in a deep, common passion for prayer and preaching. It is a scandal that their heirs have done so much worse, turning their debates into doctrines that divide us into camps and parties. Then Jesus called the twelve together and gave them power and authority over all demons and to cure diseases, and he sent them out to proclaim the kingdom of God and to heal. He said to them, “Take nothing for your journey, no staff, nor bag, nor bread, nor money—not even an extra tunic. Whatever house you enter, stay there, and leave from there. Wherever they do not welcome you, as you are leaving that town shake the dust off your feet as a testimony against them.” They departed and went through the villages, bringing the good news and curing diseases everywhere (9:1-6, NRSV). John answered, “Master, we saw someone casting out demons in your name, and we tried to stop him, because he does not follow with us.” But Jesus said to him, “Do not stop him; for whoever is not against you is for you” (Luke 9:46-50, NRSV). Jesus clearly forbad his disciples from opposing ministering servants who were casting out demons without direct authorization from Jesus and his disciples. Read this text again if you do not see how clearly it is stated. He said, “Whoever is not against you is for you.” This is a teaching that makes no sense to many conservative Christians that I’ve known but then it would have made no sense to me twenty-five years ago. 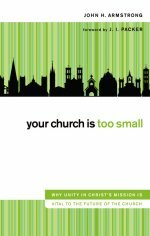 Sometimes we have to give up our fear to embrace a church that is not too small. Then there is John 17. I’ll say more about it tomorrow. Edmund Conroy liked this on Facebook. I think we can change “sometimes” to “We must” in the final sentence. Brian Considine liked this on Facebook.